The tiny Chinese village called “Rack-Armor Terrace” has been occupied by Japanese for several years. 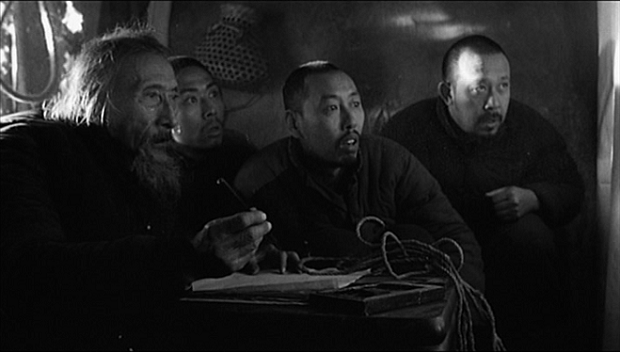 One of its citizens, the meek Ma Dasan (director Jiang Wen) gets on a knock on his door one fateful night. A menacing stranger leaves Ma two large burlap sacks, containing a captured Japanese officer and his interpreter. The stranger tells Ma to keep them hidden and interrogate them, and he’ll be back to collect them at New Year. Weeks pass, New Year comes and goes, and Ma and the other villagers get increasingly panicked about how to handle their unwanted hostages. I’ve probably gushed enough about this film in previous reviews. Although rather long at 140 minutes, Jiang keeps escalating the situation and introducing new dimensions. He has an extremely deft hand at black comedy, the film is packed with humor. The squabbles among the villagers, passing blame and saving face and trying to figure out the easiest route to not getting themselves killed. The translator who deliberately mistranslates the officer’s furious curses against his captors. Tense situations are not undercut (because the tension still remains) but laced with humor, and the comedy gets blacker and blacker. Until suddenly, shockingly, it’s not so funny anymore. War renders everything in its path absurd… absurd and meaningless and horrifying. Whether your motivations are fear or compassion or madness, all that matters at any given moment is who holds the power. This entry was posted on July 14, 2012 at 5:51 pm	and is filed under Movie Reviews. You can follow any responses to this entry through the RSS 2.0 feed. You can leave a response, or trackback from your own site.